Taking on the latest in the controversy about the best for public school students from the viewpoints in a family of teachers and trainers. 2019 – Change for Schools? Scarcely a month in 2019 has passed by before teachers have continued to stand up and go forth for change. Fortunately, district administration and negotiators react quickly. The longest so far has been the Los Angeles UTLA strike that lasted six days. The biggest concession for L.A. was to put a state cap on charter schools and voucher payouts. The West Virginia state legislature backed down when teachers walked out for two days (second time in less than a year) over starting charters and a voucher plan for tuition to private school. Denver teachers struck for three days and the most contentious negotiation was over the status of ProComp which provides incentives and bonuses over the base pay. The plan sounds good in theory, motivating teachers to work to improve the education in low-performing schools, but the plan needed revision. Oakland, California, teachers began a strike on Thursday, February 21, 2019, when negotiations stopped over salary increases in a region where the cost of living is among the highest in the state. 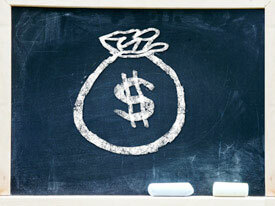 The quandary is that the district is going broke. Fury over which schools to close because of student demographic losses adds to the tension. Only close the low-performing schools in the flat lands or close high-performing schools in the hills? It’s a mystery how the disparate issues, all involving money, will be solved. No agreement as of this post. At the same time, what does the president say about education in the State of the Union address on January 28? “To help support working parents, the time has come to pass school choice for America’s children.” Then he went on about socialism. It doesn’t appear that he is on the same wavelength as teachers across the country. Further, in support of the president at the border wall in El Paso, Texas, on February 11, DJT Jr came out with “You don’t have to be indoctrinated by these loser teachers that are trying to sell you on socialism from birth.” What kind of school did he go to? In the meantime, the House of Representatives Judiciary Committee has approved HR 8- Bipartisan Background Check Act of 2019, authored by Mike Thompson (CA), just in time to remember the mass high school shooting in Parkland, Florida. In the Senate a similar bill to require background checks for all gun purchases, S 42-Background Check Expansion Act, authored by Christopher Murphy (CN), is still in the Senate Judiciary Committee. One hopes with a bipartisan effort the bill will make it to the House floor for a vote, and the Senate will do the same. See Every Town for Gun Safety research on why the legislation is needed. 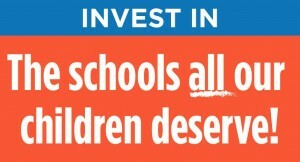 The House of Representatives Labor and Education Committee under Chairman Bobby Scott (VA) has held hearings for a HR 865, the $100 billion Rebuild America’s Schools Act of 2019. The Senate has S 266, a similar bill, in committee. The legislation’s funds are mainly to address infrastructure repair in the country’s, on average, 44-year-old schools and, also, for districts that are under-funded predominantly in high poverty areas. Since the 116th Congress has begun, actions by Betsy DeVos, Superintendent of Education, have come to the House Labor and Education Committee’s attention, including decisions for taxpayer money to prop up failing for-profit colleges because she rescinded the actions that The Council for Independent Colleges and Schools can take to pull money from such schools. The superintendent is also likely to be questioned about policies she rescinded that are meant to protect minority students from excessive suspension and from placement in special education. ‘To rescind’ has been an action verb well-used by Ms. DeVos, but let’s hope that positive actions for students will occur with the oversight of the House of Representatives Labor and Education Committee. Comments Off on 2019 – Change for Schools? Is this a joke? This year’s National School Choice Week (NSCW) – January 20-26, 2019 – to supposedly celebrate with thousands of events for the many choices that parents and students have for their education is not what it seems. For Take Care Schools, the first clue is that Betsy DeVos, charter and voucher advocate, is a firm long-time supporter. The website states it wants to celebrate traditional public schools, public charter schools, public magnet schools, private schools, online academies, and homeschooling. When searching for schools only in the California Bay Area, full of a diverse education selection, I did not find any traditional or magnet public schools highlighted, but plenty of charters, private, and religious schools. Not surprising since the president, Andrew Campanella, of the NSCW organization, while desiring to celebrate the good in schools, is a proponent of choosing charters and using vouchers. It turns out NSCW is “a carefully crafted public relations campaign designed to remind lawmakers of the financial muscle of its sponsors” with dances, cheers, and signature yellow scarves for free (Carol Burris, Network for Public Education). With further examination by Media Matters in 2016, the last time any organizations were listed on the website, it was funded by conservative groups like American Legislative Exchange Council (ALEC), Gleason Family Foundation, Cato Institute, Freedom Foundation, and Heritage Foundation, to name a few. For 2019 the website doesn’t list its funders. The joke, coincidence or not, is that the celebratory week comes just as Los Angeles Unified School District endured a serious six-day strike that ended Wednesday, January 23, and the federal government has been shut down. Federal funds for schools were on hold until January 25, when it looks like the government will open for the time being. 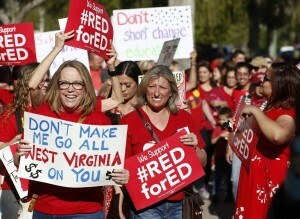 The Los Angeles Unified School District strike comes not long after strikes last year in West Virginia, Oklahoma, and Arizona and may be followed by striking teachers in Denver, CO and Oakland, CA. What is the strike result? The negotiating team used strategies from Bargaining for the Common Good and involved parents and the community which led to good outcomes. First, teachers will get a 6% raise over two years; class size will be reduced, especially in high school English and Math classes; a nurse at every school five days a week; more counselors (1:500 students) and a librarian five days a week for every high school. Working groups will be formed to address the lack of resources for Special Education and excessive standardized testing (to be cut in half). In addition, schools will curtail and revise ‘random search’ procedures which lead to fear in schools. The district will replace the industrial look of many schools by planting green areas, thought to have a therapeutic effect on the atmosphere in schools. 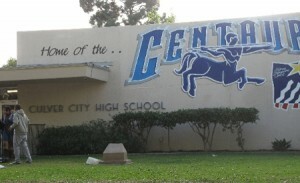 In addition, Eric Garcetti, the mayor of Los Angeles, will support the Schools and Communities First initiative to be placed on the November 2020 ballot in which commercial property taxes will be revised in response to 1978 Proposition 13 regulations. When these changes take effect in the second largest school district in the country, let’s hope that next year every single student in Los Angeles and California will wear the NCSW yellow scarf to celebrate the beginning of victory for improvements. The scarves are free, just order them. The organizations supporting National School Choice Week pay for them. School takes a break for the winter holidays, a time to relax and enjoy time with friends and relations. Except there’s no break from the anxiety for schools produced by the current president and his administration. On the one hand, the administration claims, with no evidence so far, that districts are pressured to keep dangerous students in school. On the other hand, long time research shows that the numbers of suspensions are a strong factor in dropping out of school. Disproportionate school discipline constitutes discrimination, and the American Association of University Women, for one, urges the administration to reverse this action and instead reaffirm their commitment to supporting equal rights and opportunity for all. Winter holidays always include lots of time for delicious food. 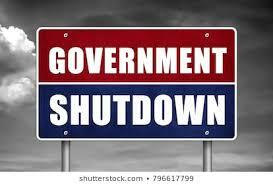 However, families with children will be affected by the government partial shutdown of many agencies and, most important, by the Department of Agriculture (DOA). Nevertheless, days after signing the bill, the president along with DOA Secretary Sunny Perdue have found a way around the bill to place more stringent work requirements on adults who rely on SNAP. Supposedly, the rules would apply only to single adults, but there are many who work for schools and who still rely on food assistance. In addition, Perdue plans to relax the Healthy, Hunger-Free Kids Act school lunch rules implemented in 2010. Three provisions for grains, dairy, and sodium in school lunches are to be revised. Perdue seems most interested in allowing sugary flavored chocolate milk to return to schools. Improving health by using whole grain rich foods does not mean complaints, according to Ann Cooper, Food Services Director from Boulder Valley Schools, Colorado. Few schools have requested exemptions. Relaxing restrictions on sodium content in food is not as tricky or as conflict-consuming an issue. Schools will not be required to pursue the correct sodium content as aggressively as in the 2010 rules. Although 99 percent of schools have reported that they can meet the 2010 rules according to a USDA report in 2016, the School Nutrition Association, advocate for the country’s food companies, love the changes. Not good news for children’s school lunch health. What do trade tariffs easing and now the shutdown mean for students? The DOA is not completely shut down. However, according to Senator and Vice Chair Leahy of the Senate Appropriations Committee, with the trade extension, USDA plans to distribute $1.2 billion in commodities through The Emergency Food Assistance Program (TEFAP), which provides supplemental food to soup kitchens, food banks, and pantries. Help is needed to mitigate this influx of commodities, but a shutdown would really hamper this program. The Food and Nutrition Service would not be able to purchase commodities or provide the funding for transportation, distribution, or storage. This could be especially harmful to food banks that receive these commodities at a time when more families rely on their services – the winter and holiday months. With that news, happy holidays and, we wish, hope, and call on the administration to see the light by the New Year. The House of Representatives flipped this month, giving Take Care Schools hope for better legislative results for public school students. Even so, several steps have been finalized by Betsy DeVos and the United States Department of Education (DOE) that are not decisions to cheer for. After issuing a few details at a time all year, on November 17, 2018, the new sexual assault regulations have been overhauled and released by Superintendent of Education, Betsy DeVos. With a few words of support to protect victims, the main support is regulation changes for the accused and, above all, to reduce the liability to schools. The institutions can choose a higher standard for evidence of sexual attack or abuse and establish an appeals process for the accused that allows cross-examination. All of these regs will help schools not be found in violation of Title IX and susceptible to the threat of pulling federal funding (although that has never happened). The rules will go into effect after a 60-day comment period. Betsy DeVos lost in a decision by the court in favor of the Attorneys General of 19 states in September 2013 concerning student loan procedures. Problems with the DOE’s enforcement of regulations for student loan servicing is still being discovered, this time posted by the Associated Press on November 20, 2018. It has been found that Navient, the third largest provider of student loans, drove borrowers into higher-cost repayment loan procedures. After the DOE found indications of deception by Navient, the department argued that they don’t have jurisdiction to admonish or litigate the issue. Attorneys General for California, Illinois, Mississippi, Pennsylvania, and Washington filed lawsuits on behalf of students who were offered 3-year maximum forbearance (with interest accumulating) or the repayment plan. Other possible plans were not mentioned, breaking student loan regulations. Furthermore, the Department of Homeland Security has expanded the definition of “public charge” (someone deemed likely to depend on the US government for subsistence). With the proposal, again open to public comment until December 10, immigrant families must choose between a green card and access to basic needs like food, shelter, and health care. What will happen to children in school? Damage to emotional stability and health will lead to difficulties in learning. Finally, on Friday, November 23, 2018, the administration released The Fourth National Climate Assessment. The administration continues to ignore the report’s disclosures and to roll back environmental regulations, claiming that fewer rules touching industry will improve the economy. Surely pollution will increase. Particulate matter from fire and poor air quality keeps students inside, not allowing recess and physical education and increasing respiratory illness. Lead in drinking water and groundwater brings neurological problems which leads to more special needs help in schools. New studies have shown that pollution affecting mothers also affects their unborn fetuses which later affects the child’s chances to succeed in academic learning. In the face of these decisions and studies, by the winter holidays students and teachers will have completed a third of the 2018-2019 school year. After the New Year, let’s hope for better outcomes. Ongoing posts by CJN, Claire Noonan, M.A., elementary teacher in large urban schools with fifteen years in the classroom and twenty years supervising and coaching the reading/language arts curriculum. Occasional posts by PEN, Paula Noonan, Ph.D., thirty years in training and consulting services to companies across the nation and content expert/teacher of M.Ed. programs for Jones International University. Periodic posts by SEN, Sarah Noonan, the teacher starting her career in a suburban elementary school hit with all the budget and achievement dilemmas in beautiful California.